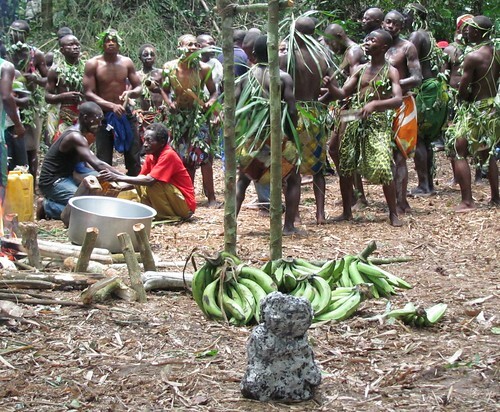 The imperturbable ancestor sat in front of the plantains at the opening of the ceremony. 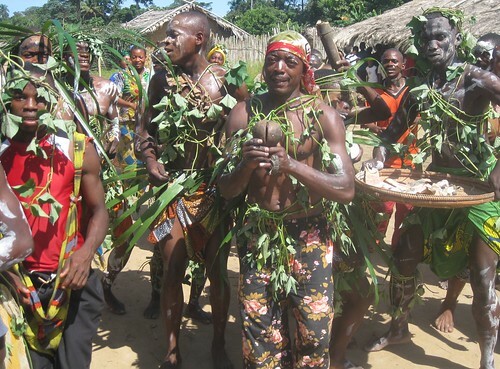 Our last tambiko took place in the village of Masiri, a 6km walk inland from the port village of Lowa on the Congo-Lualaba River. 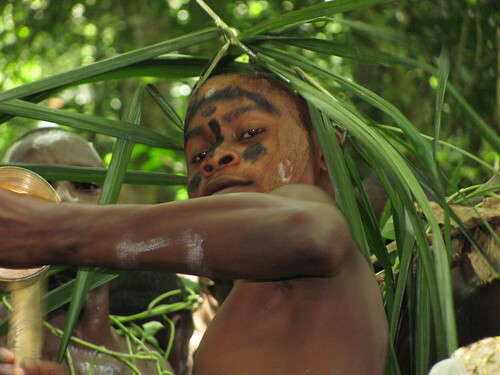 This was a ceremony of the Mituku peoples and the Lengola peoples. Their ancestors know this forest. Basic tenet: the understanding of the dead is deeper than the experience of the living. The question put before the ancestors: … a national park? Their word came through the ceremony. We came in dugouts. 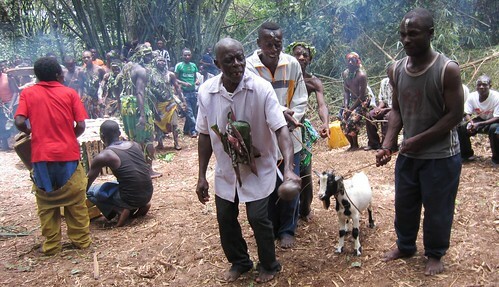 I came south with a delegation from Kisangani. 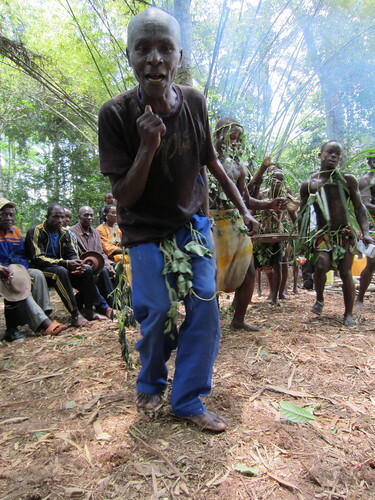 John came north with a delegation from Kindu. On this map tambiko sites are red squares. 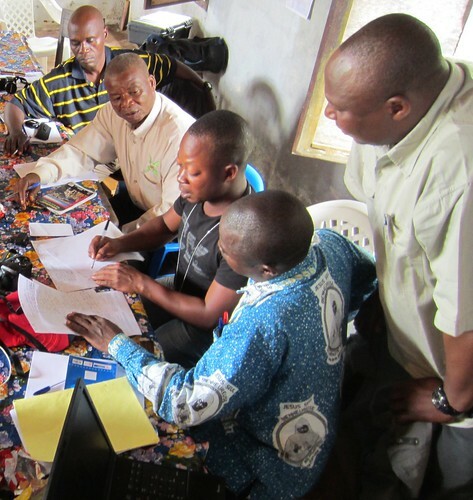 This was the last tambiko consultation before pushing the park proposal from the village up into the highest offices of the provinces – two provinces are involved: Orientale and Maniema. 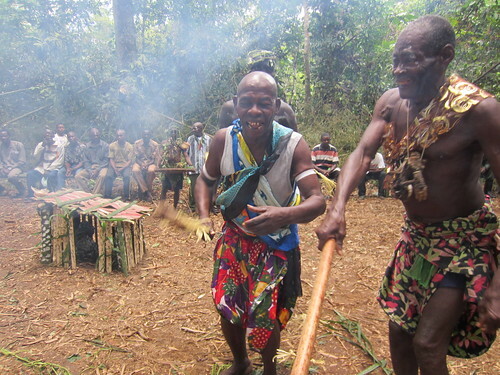 At this last ceremony, along the Congo River, key people came from both provinces and all ethnic groups. 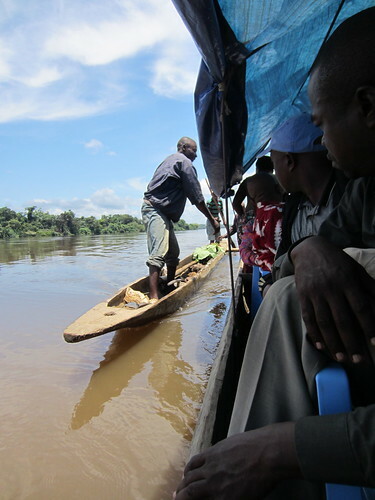 A small fishing dugout comes up to our much larger dugout to sell fish for our overnight bivouac on the banks of the Congo. 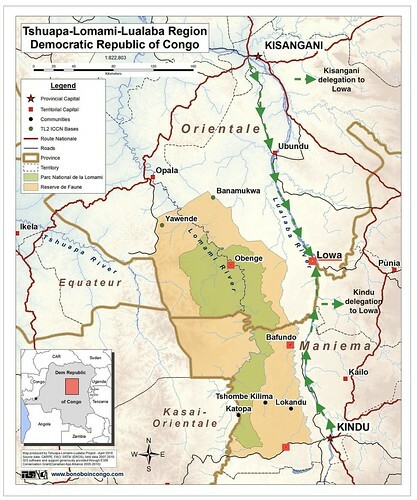 Two days in motorized dugout whether coming from Kisangani or Kindu. Included was a technical group from the cabinets of both governors, the cabinets of both environmental ministers, and the land tenure bureaus. They met to hash out details, harmonize approaches and finalize a text for national park creation. The delegations from Kindu and Kisangani in all day session to finalize one version of the park proposal. Our reunion on the banks of the Congo River was at the old (now decrepit) catholic mission of Lowa. After a day of discussion and rewriting, we were called to the village of Masiri by elders from both Lengola and Mituku ethnic groups. We were greeted in the village, but told to keep walking. 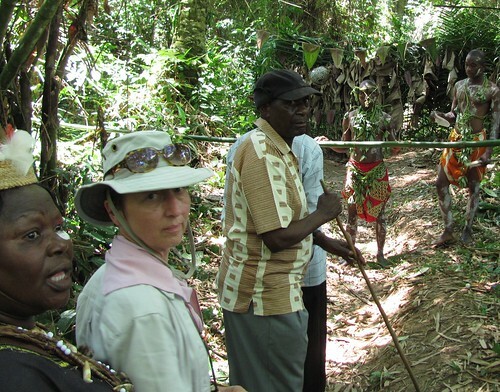 From Masiri we were called into the forest, another two kilometers to a cleared site for the tambiko. There were confusing barriers along the way…. The whole procession of us waited, uncertain how to proceed at four different barriers. 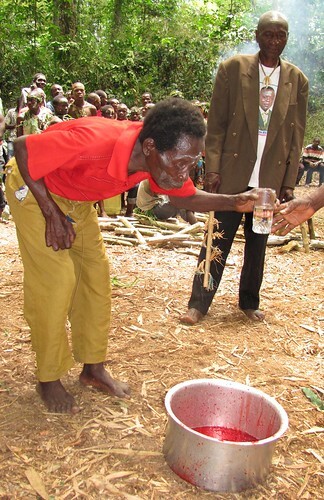 Political figures and “foreign” chiefs, alike, were all made to understand that the local people made the rules. After we finally arrived, the tambiko became several hours of intoxicating singing and dancing. and old were part of the dance and music. The elders’passion spoke through music more than oration as the ancestor watched from its small bamboo shelter. The elders awaited a sign from the goat. Apparently the goat turned the right way at the right moment as it was led through the clearing. The park was approved. 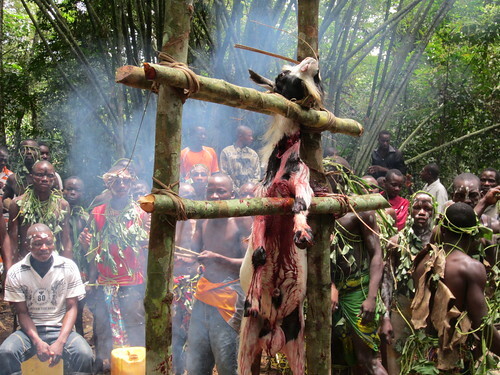 The goat was duly strung up and sacrificed. With words and saliva the chiefs bless the blood, we are all anointed, the ceremony ends. It was a couple weeks later that we met in Kisangani. The traditional ceremonies were over. They had been held by all the peoples living around the perimeter of the Park, who have ancestral forest within the Park: the Ngengele, the Langa, the Mbole, the Mituku and the Lengola. Now we were taking their agreement along with our information to present to the governor of Orientale Province – would he sign?? He did – with much fanfare. 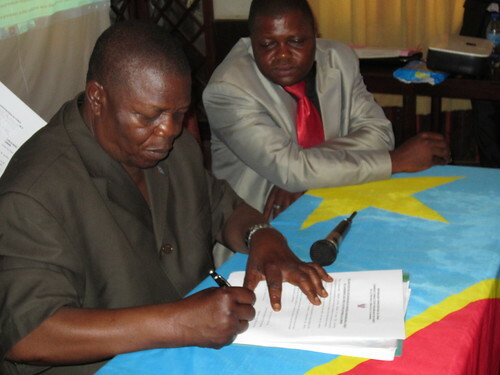 And now the governor of Maniema has signed as well. The governor of Orientale signs before a packed room of government and provincial witnesses. Yesterday, the file was on the desk of the national environmental minister. He will move it to the president. 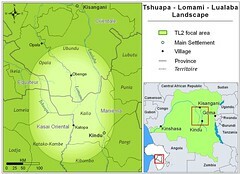 As soon as I hear whether or not DR Congo gets a new Lomami National Park – it will be posted here. 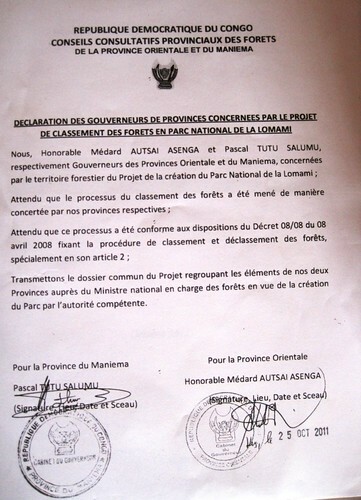 The governors of both provinces have agreed to the Lomami National Park — now the president! This entry was written by Terese Hart, posted on 2011-11-16 at 11:20 pm, filed under Indigenous peoples, Kisangani. Bookmark the permalink. Follow any comments here with the RSS feed for this post. Post a comment or leave a trackback: Trackback URL. Thanks for this lovely post. I enjoyed your descriptions of the trip and the ceremony. Congrats on the good news from the ancestors, the goat, and the governors. I’ll be watching for more good news about the park in the future. HOPING to have good news soon…. ?? YES Mama! Great post, great work my dear parents! All those years of hard work and it comes down to which way a goat decides to walk! Thanks doctorfor the wonderful insight and great work in conservation. Mine is a question not directly related to your work area, but I beilve you know something about the neighbourhood. I have been approached to help get financing for the orientale mining cooperatives. Im told they are into gold and diamonds, and need help in marketing thier stones, making sure they arent conned, and helping facilitate communiyt development initiatives. Any advise you have about the cooperative movement, viability of such a project, security or any other details, are very welcome.